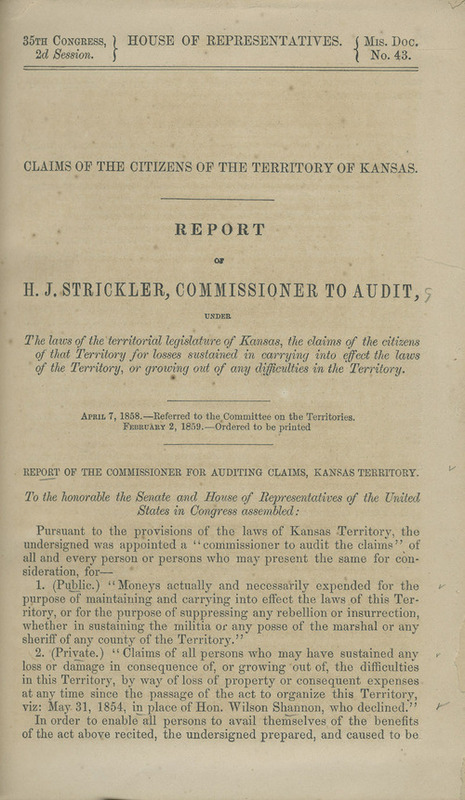 This introduction to the Report of H. J. Strickler, Commissioner to Audit Claims of the Citizens of the Territory of Kansas explains how the claims process worked, including how notices of the various hearings were published. Each claimant had to submit an itemized list and have two witnesses attest to the losses claimed. The introduction also provides definitions of public and private class because claims were assigned to these two classes. The claims were submitted during 1857 with the report presented to Congress on April 7, 1858. Claims for losses since May 31, 1854, were eligible for consideration. The report is dated February 27, 1858. A number of the specific claims are part of this publication. Even though many of these claims were approved for payment, no funds were ever appropriated or distributed.